Mogul Maniac is a first-person sports game that reproduces a downhill slalom ski run. The objective is to ski down a mountain as quickly as possible while navigating between the open (side-by-side) and closed gates (vertically staggered poles). Missing a gate either costs you a five second penalty (Novice) or sees you immediately disqualified (Expert). A handy counter in the top-right keeps track of the remaining number of gates, and you can control your speed by pressing Up or Down on the joystick. There's nine courses in total and the right difficulty switch allows you to select whether the hills include moguls (e.g. mounds of snow that create bumps). There's not much variety between courses, but the continual increases in max speed per route make a big difference in terms of both challenge and strategy. Most of the fun comes from learning where to delicately and precisely control your speed in order to gain the best times; when you do get on a roll (especially in a two-player competitive match) it's extremely enjoyable to gracefully glide between gates and then floor it when you see the finish line! The sense of speed is good and I really like how the environment bobs up-and-down to simulate your skier's movement and the incoming moguls. Collision detection is great too and just like in professional skiing you can pretty much brush against the gates without being penalised; this is brilliant for shaving off those precious one-tenths of a second against your previous best. That's the compulsive nature that the gameplay relies on, and whether you fully enjoy it depends on whether you like delving into the minutia and obsessing over optimal speed control. 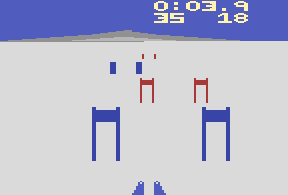 Mogul Maniac is an impressive first-person sports game that effectively simulates skiing on the Atari 2600's humble hardware. It does get a little repetitive and it's possible to see everything it has to offer very quickly, but there's still a lot of fun to be had, particularly if you have a friend to trade best times with! Random trivia: The game is also compatible with the Joyboard which is a balance board peripheral.